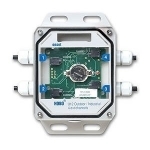 View our range of Data Loggers designed for outdoor or environmentally challenging applications. The range includes small, low-cost, waterproof pendant loggers. Variants available include models for measuring temperature and/or light plus a G logger which measures acceleration or angular displacement in 1, 2 or 3 axes. Bluetooth Temperature Data Logger, Low cost, Splashproof. -30 to +70'C range..
Bluetooth Temperature/Humidity Data Logger for Outside use (IP67), with external sensor probe. Simple Data Logger, USB Download to monitor Wind Speed & Direction or Temperature & Rainfall. The HOBO U12 Outdoor/Industrial Logger provides 4 channels of input from a wide range of external sensors, including temperature, AC current, AC voltage, CO2, 4-20mA, and DC voltage cables. The rugged, weatherproof enclosure is designed for use in harsh outdoor and and industrial applications. The HOBO Pendant Event Logger is ideal for rainfall logging and connects to most standard tipping-bucket rain gauges to determine rainfall rates, times, and duration. The HOBO U12 Stainless Temp Logger is designed for food, pharmaceutical, autoclave, and other applications where high-accuracy temperature data is critical. The HOBO U12 Stainless 5-inch Probe Temp Logger is ideal for monitoring internal temperature of foods or any application where fast response is critical. The HOBO Pro v2 Temp/RH logger is a weatherproof data logger with built-in temperature and RH sensors. The RH sensor provides superior durability in humid environments and is user replaceable. The HOBO Pro v2 Ext Temp/RH Logger is a weatherproof data logger with an external Temperature and RH sensor on a 6-foot cable for fast sensor response and deployment in tight spaces. The RH sensor features fast response and superior durability in humid environments, and is user-replaceable. The HOBO Pro v2 2x Ext Temp Logger is a weatherproof data logger with two external soil/water temperature probes on 6-foot cables for fast sensor response and deployment in tight spaces. The HOBO Pro v2 Temp/Ext Temp logger is a weatherproof data logger with an external soil/water temperature sensor on a 6-foot cable useful for situations where just one temperature probes is required. An internal temperature sensor is also included. The HOBO® Pendant G logger measures acceleration or angular displacement in 1, 2 or 3 axes. Applications include monitoring sports activity, medical therapy compliance, or any activity or process where 3-dimensional motion is present. Temperature/Humidity Data Logger with LCD Display, IP66 casing & Ethernet (ModbusTCP/MQTT) communications for configuration and download. Utility + Android/iOS Appsincluded. Temperature/Humidity Data Logger with LCD Display, IP66 casing & ModbusRTU RS485 communications for configuration and download. Utility included.